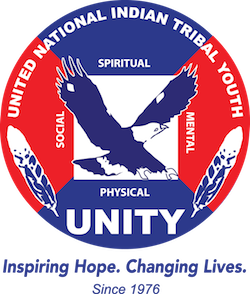 UNITY Training offered to Tulalip Youth Council – UNITY, Inc.
About 14 youth leaders from the Tulalip Tribes recently participated in a UNITY training in Tulalip, Washington. The training, to develop a youth council constitution and bylaws, took place after the newly elected officers of the Tulalip Sr. and Jr. Youth Councils were sworn in before the Tulalip Tribal Council. The Tulalip Youth Council spent an entire day doing team-building exercises and drafting an entire constitution and bylaws. The training was conducted by UNITY Wellness Warrior’s Program Coordinator Josh Tso, Navajo, UNITY’s Executive Director Mary Kim Titla, San Carlos Apache, and Hamilton Seymour, Nooksack/Stz’uminus First Nation, who served as a peer leader. UNITY offers culturally relevant leadership development training, which further supports its mission to foster the spiritual, mental, physical, and social development of American Indian and Alaska Native youth and to help build a strong, unified, and self-reliant Native America through greater youth involvement. Training may include but is not limited to team building activities, action planning, and event promotion, developing a constitution and bylaws, developing community service projects, and how to create a UNITY youth council. UNITY thanks the Tulalip Tribes for sponsoring the training and wishes the Tulalip Sr. and Jr. Youth Councils all the best in the next year!